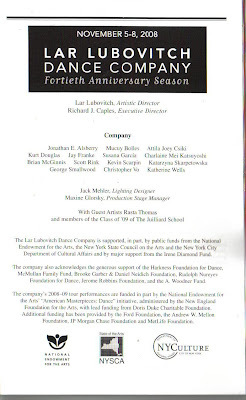 I went to the Lar Lubovitch Dance Company's performance at City Center last night. 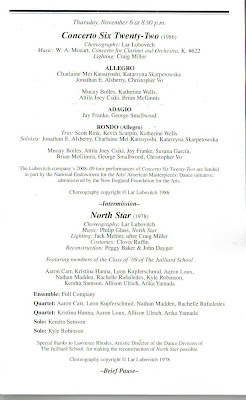 My first introduction to this company was last spring when I volunteered at their gala through The Actors Fund. The performance was spectacular! Although at times it was just strange and too mondern for me - choreography to Philip Glass looked like seizures and I finally had to close my eyes - overall it was gorgeous. The first dance to W. A. Mozart's Concerto Six Twenty-Two was playful and joyful. 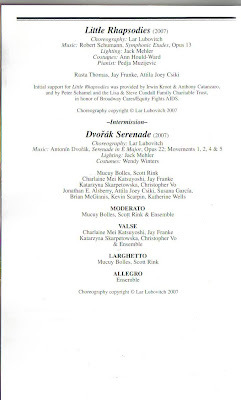 The last dance was to Dvorak's Serenade and was simply breathtaking. Really, it was achingly beautiful. I wanted to rewind it and watch it all over again. They have two more performances - tonight and tomorrow night at 8:00 pm at City Center. "...choreography to Philip Glass looked like seizures and I finally had to close my eyes..."
Funniest thing I've ever known you've ever written today.